EURUSD is under the influence of some economic reports such as ZEW Economic Sentiment, German WPI m/m, and French Final Non-Farm Payrolls q/q in Eurozone and 30-y Bond Auction, Core PPI m/m, PPI m/m, and NFIB Small Business Index in the US. 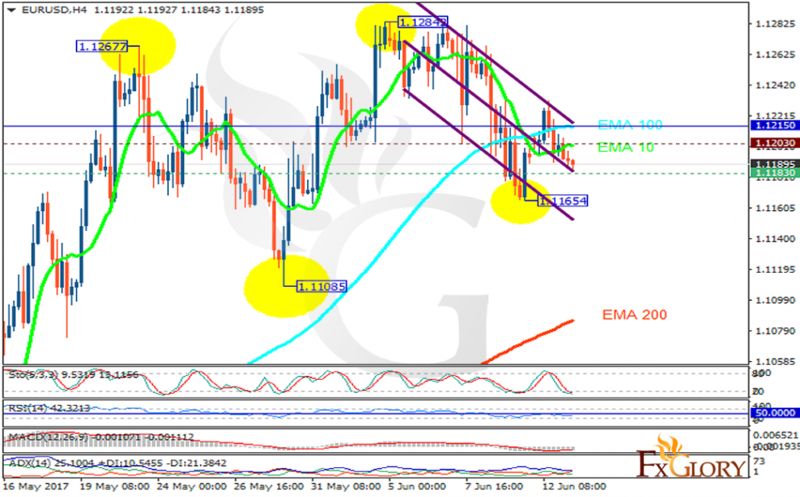 The support rests at 1.11830 with resistance at 1.12030 which both lines are below the weekly pivot point at 1.12150. The EMA of 10 is moving horizontally and it is above the EMA of 200 and below the EMA of 100. The RSI is falling towards the oversold area, the Stochastic is showing downward momentum and the MACD indicator is in negative territory. The ADX is showing sell signals. EURUSD is falling down towards the 1.108 area however, 1.10 level seems to be a strong support area therefore long positions are recommended for long term traders.